A very soft 12 year old. 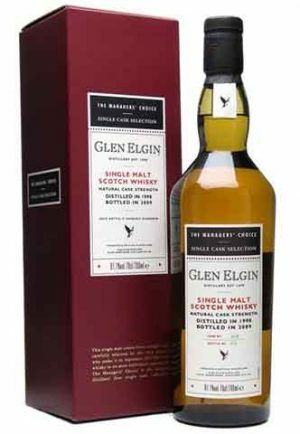 This distillery bottling replaces the previous very popular Flora & Fauna issue of Glen Elgin, and represents great value for money. Its style is smooth, mellow and sweetly honeyed. Soft spring water comes from the area of Millbuies Loch to the south-east of the distillery. 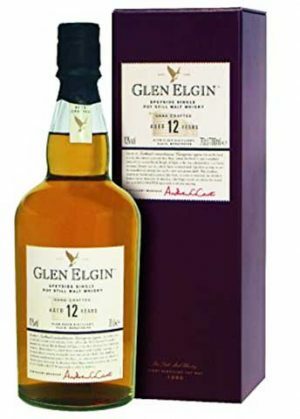 Glen Elgin Vintage 1998 Managers Choice is bottled at full cask strength, this is part of Diageo's 'Managers' Choice' series where a special single cask is selected for bottling. The single cask malts are first tasted blind, in small groups, and then re-evaluated by other experts. There is inevitably much debate and discussion as each expression is nosed and tasted. But finally a consensus is agreed and a cask is selected for release. The cask selected is a unique expression of the distillery's single malt. Limited edition, bottled in 2009, cask No 3678, European Oak, only 534 bottles released. "Sweet and light with citrus and vanilla flavours"